Many foods on the market today are advertised as being healthy. But a closer examination of the contents reveals UNhealthy ingredients that can add fat, more calories and fillers that are not good for you. Veggie patties – if you think you’re eating healthy by substituting meat with vegetable patties, think again. They are often processed, frozen and contain fillers that add fat. Packaged turkey – turkey is good for you, but packaged turkey can be full of sodium. If you want a turkey sandwich, either look for low-sodium or slice off turkey from last night’s dinner and use for sandwiches. 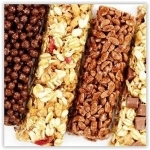 Energy bars – not all energy bars are the same. Some contain as many calories as a Snickers bar. You must read the label to ensure what you’re eating is healthy. Keep the calories under 200 and make sure the sugar per serving is no more than 20 grams. Bran muffins – who doesn’t enjoy a good bran muffin for breakfast. Watch the ingredients; store muffins can be loaded with sugar. Try making them yourself using whole wheat flour and instead of butter, top it with applesauce. Rice cakes – most people think rice cakes are healthy snacks, but they are 80 percent carbohydrates, compared with a potato which is 23 percent carbohydrates. Pretzels – did you know that pretzels are made from white flour? White flour is refined, stripped of all the good stuff. Although pretzels are low fat and low calories, they have no nutritional value. Reduced fat peanut butter – did you know that the calories are about the same in reduced fat as in regular peanut butter? Plus, reduced fat contains more sugar, so just eat regular peanut butter. Instant oatmeal (flavored) – oatmeal is good for you, but flavored instant oatmeal contains more sugar and sodium than regular rolled oats.